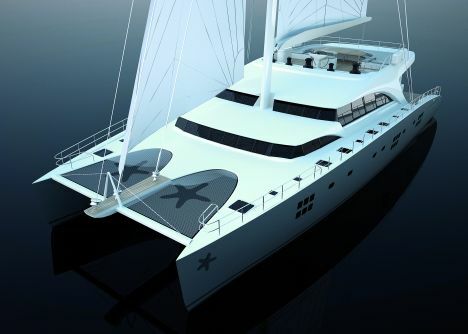 The Polish ship yard specialized in the production of catamarans as both sailing and motor yachts from 60 ft. to 122 ft .in composite materials, steel or aluminium, has recently presented the new project for the Sunreef 92. This ultra modern catamaran accommodates up to fourteen passengers in absolute comfort. At first glance one notices the shape of the superstructure which normally hosts an ample fly. The wheel, controls, as well as halyard and sheet winches, are all conveniently housed there together with an open air sofa, dining table and plenty of space in which to sunbathe and relax. This is surely an adequate choice for such a yacht also because of a rigid protection in the shape of an extension protruding aft of the fly and cockpit providing precious shade in daylight hours. The tender lodges on a step up platform in the stern between the two hulls .A moulded stairway leads to the cockpit. This model is designed for long range blue water cruising in comfort and good company . Considering all the advantages derived from such a multi-hull capable of higher sailing performances, as well as larger areas both below deck and above, as well as improved stability due to shape translate this yacht into one of not only accrued comfort but of safety as well. Below deck both rationality and care have been taken to maximize space as well as in the choice of high quality material. Chromatic taste has been deployed to convey the desired effect in every area that the size and proportion of this multi-hull command. The internal control station is also beautiful with its motor yacht style but equipped with solutions that effectively can control and monitor the entire sail plan as well as all the on board systems. Conviviality and leisure highlight the areas below deck . Generous glass panelling surround the superstructure offering bright light within. Both hulls are also bright and with six doubles, one twin and one single cabin completing the night layout with as many en suite bathrooms convey a truly welcoming feeling of space throughout the lower deck. One of the double cabins situated below the upper deck takes up the full beam of the entire superstructure making it unique for its size, position and view.